Timely and accurate staging of oesophago-gastric cancer can prevent unnecessary surgical intervention and associated patient morbidity. Role of peritoneal cytology in staging of theses cancers is not well established. We conducted a survey among Upper GI surgeons to get their views regarding the role of peritoneal cytology in upper GI cancers. A questionnaire was designed to assess the role of peritoneal cytology. It was distributed via Association of Upper Gastro-Intestinal Surgeons to all its members. Of all the surgeons, 30% use peritoneal cytology for staging of oesophago-gastric cancers. On asking the cause for not using peritoneal cytology, 52% reported low yield as the cause and only 4% believed that it is not a strong predictor of survival. On the contrary, 85% of the surgeons using peritoneal cytology said that they would consider no surgery or palliative surgery if it was positive. 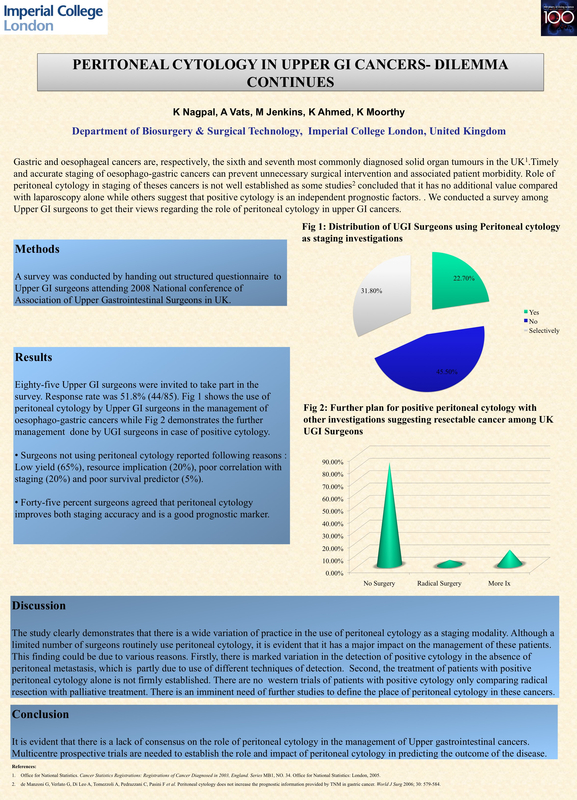 Forty-five percent surgeons agreed that peritoneal cytology improves staging accuracy and is a good prognostic marker. The study clearly demonstrates that there is a wide variation in the use of peritoneal cytology as a staging modality. Although a limited number of surgeons routinely use peritoneal cytology, it is evident that it has a major impact on the management of these patients. Further research is needed to define its role in Upper GI cancer management.